Increased organization of an area of disturbed weather shows rotation this morning in the far eastern tropical Atlantic. This are will likely be classified as Lee later today. As of 5:00 AM AST 14L was centered at 10.6 N / 27.3 W or 435 miles SSW of the Cabo Verde Islands. It was moving west at 14 mph. Top sustained winds are estimated at 35 mph. Pressure was estimated at 1008 MB. 14 L is forecast to move west in the deep tropics for a few days and strengthen. After that an upper air trough is forecast to increase wind shear and turn it NW. This will also weaken the tropical cyclone. TD 14 has been fighting wind shear still. The shear may relax enough for it to be upgraded to Lee. In fact, the latest satellite imagery shows that convection has increased enough that NHC may classify it on the next update. It will likely then weaken again as an upper air trough weakens it again. As of 5:00 AM AST 14L was centered at 12.6 N / 32.1 W or 590 miles WSW of the Cabo Verde Islands. It was moving west at 7 mph. Top sustained winds are estimated at 35 mph. Pressure was estimated at 1008 MB. 14 L is forecast to move west in the deep tropics for a few days and strengthen briefly. After that an upper air trough is forecast to increase wind shear and turn it NW. This will also weaken the tropical cyclone. Lee was classified Saturday afternoon. The satellite imagery of Lee show a badly sheared system again. It likely is no longer a tropical storm. The only convectionremaining is well south of the circulation center. 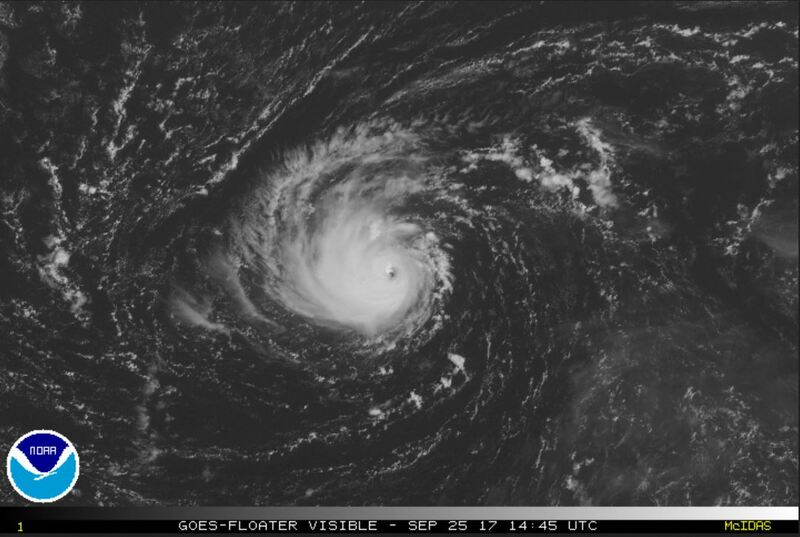 As of 5:00 AM AST Lee was centered at 13.0 N / 35.4 W or 790 miles WSW of the Cabo Verde Islands. It was moving west at 7 mph. Top sustained winds are estimated at 40 mph. Pressure was estimated at 1007 MB. Shearing will continue and Lee will lose its tropical characteristics. Lee was classified as a tropical storm again yesterday. It is rapidly strengthening and is likely stronger than the official NHC estimate of 85 mph. 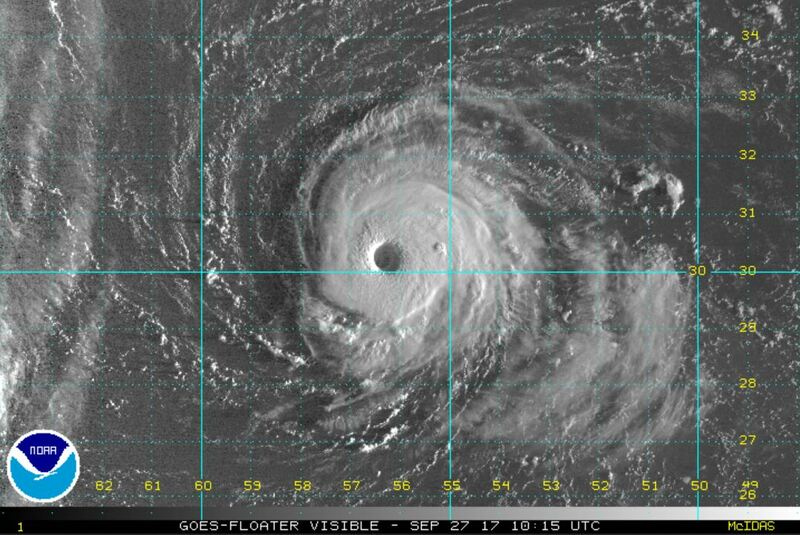 As of 5:00 AM AST Lee was centered at 31.8 N / 50.1 W or 860 miles east of Bermuda. It was moving south at 1 mph. Top sustained winds are estimated at 85 mph. Pressure was estimated at 983 MB. Lee will continue to not pose treat to land. Lee remains a very small hurricane with hurricane force winds estimated to only extend 10 miles from the center. 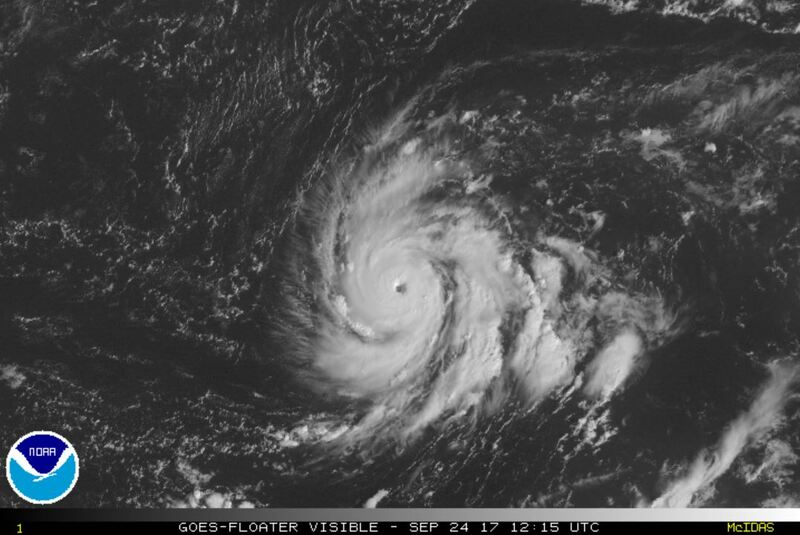 As of 11:00 AM AST Lee was centered at 30.8 N / 49.9 W or 880 miles east of Bermuda. It was moving SSW at 2 mph. Top sustained winds are estimated at 90 mph. Pressure was estimated at 980 MB. Lee will continue to not pose treat to land. It will drift west for a few days, then accelerate NE as it is picked up by an upper air trough. 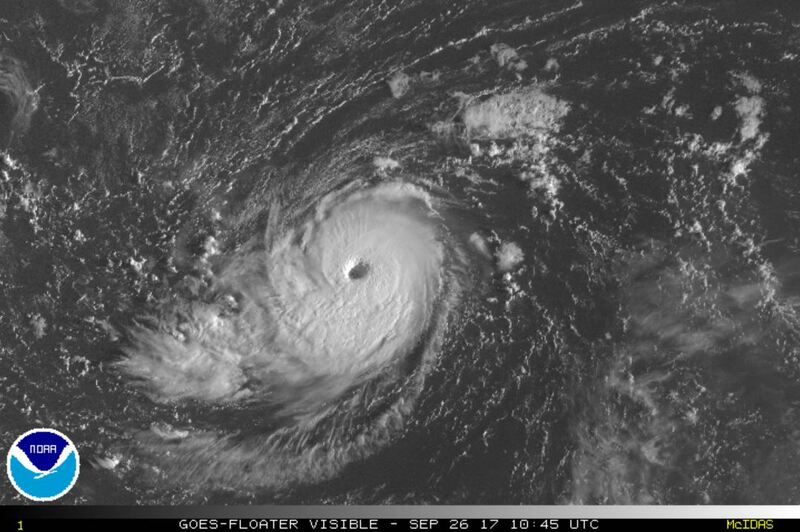 Lee's eye wall has widened and cloud tops have cooled some indicating some strengthening. 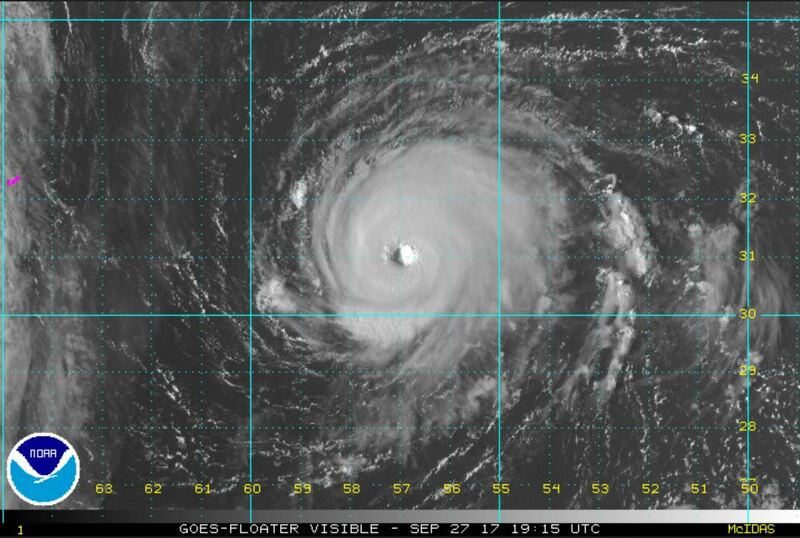 As of 5:00 AM AST Lee was centered at 30.0 N / 52.5 W or 745 miles east of Bermuda. It was moving west at 10 mph. Top sustained winds are estimated at 100 mph. Pressure was estimated at 977 MB. Lee's eye wall has widened more. It is on the verge of becoming a cat 3 hurricane. As of 5:00 AM AST Lee was centered at 30.2 N / 56.3 W or 520 miles ESE of Bermuda. It was moving WNW at 9 mph. Top sustained winds are estimated at 110 mph. Pressure was estimated at 971 MB. Lee will continue to not pose treat to land. It will drift NW today, then accelerate NE as it is picked up by an upper air trough starting by Friday. Lee seems to be fighting a little northerly shear as the convection on the north side of the tropical cyclone is not as impressive as to the south. 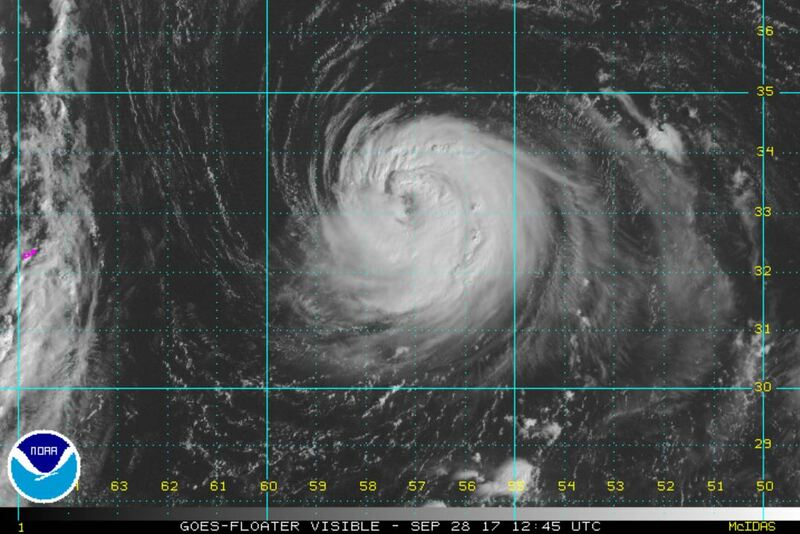 As of 5:00 AM AST Lee was centered at 32.5 N / 57.2 W or 1735 miles west of the Azores. It was moving north at 9 mph. Top sustained winds are estimated at 110 mph. Pressure was estimated at 971 MB. Lee will not pose treat to land. It will accelerate NE as it is picked up by an upper air trough starting by tomorrow. Lee is badly sheared and is dissipating. It is accelerating northeast at over 35 mph. 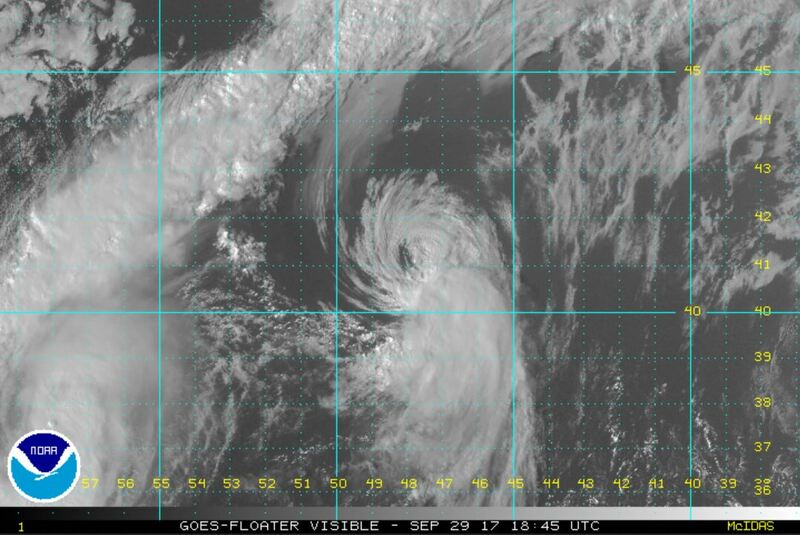 As of 5:00 PM AST Lee was centered at 42.2 N / 46.0 W or 1040 miles WNW of the Azores. It was moving NE at 36 mph. Top sustained winds are estimated at 65 mph. Pressure was estimated at 996 MB. This is the last update on Lee.